Websites that convert visitors into leads can take many different shapes and styles, but we’ve found that those with the highest conversion rates all share a set of proven best practices. These patterns, which can be applied to any website, make up the foundation of the “conversion” section of our Juicy Results Website Lead Generation Framework. The checklist we use when planning and designing a lead generation website is included below, right after this quick video where I walk you through each key item that we will need your help with during the project. Does the website have a compelling offer (or offers) that will generate leads (consultation, education, etc)? This is not the same as a contact us page or a phone number. Watch the video above for examples. Do you have emotionally charged content that stop a new visitor in their tracks, entice them to stick around and lead them to a conversion? This critical factor can not be overlooked. This article will help you understand how to create motivational content: http://bit.ly/1x8Ieey. In addition to a phone number, we recommend lead forms to capture leads. These forms need to follow some critical best practices to increase the likelihood that a visitor completes them: http://bit.ly/1hblF3P. After a user completes a lead form or takes action, are they presented clear next steps and expectations that keep them engaged and excited about moving forward? Do they receive an automated email confirming the next steps? Third-party logos and badges are proven to instill trust in visitors on the Internet. What logos can you include from media outlets, business chambers, industry groups, certifications. Examples in the video above. Make it easy for people to know they can call you, even if they don’t intend to. And, make sure the number is stupid easy for users to find when they do want to call. We also recommend a live chat for handling leads if your organization can support it. We’re looking for short, clear and high impact testimonials from your customers. Believe it or not, there are actually bad customer testimonials—those which fail to connect with or excite your prospects. More info here: http://bit.ly/1tfgguR. Last but not least, we recommend you let people “test drive” your thinking and point of view through blog posts or articles. This is extremely important for professional service firms, but we also believe it is a key element for any type of company trying to generate leads. When a user explores your website, let them find unique and helpful information with a strong point of view. Some users complete a lead form quickly, others want to browse multiple pages and get a feel for who your company is and how you think. 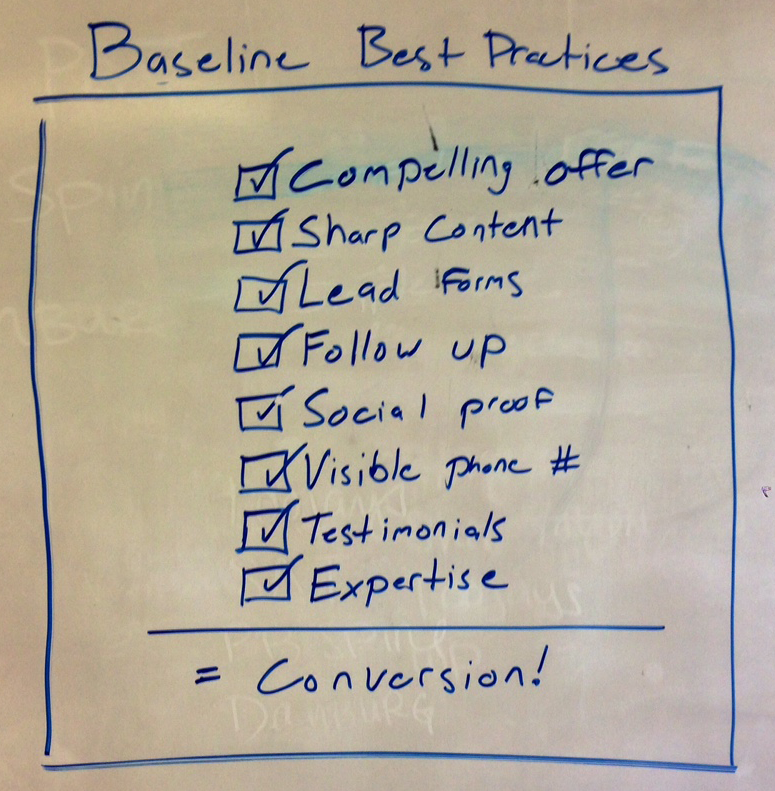 The items above are minimum best practices that we use as a starting point for all websites looking to generate leads. Once these have been established, you can begin looking into more advanced strategies for generating leads that will build on this foundation.